The third edition of the World Baseball Classic (WBC) came to a thrilling conclusion as the Dominican Republic beat Puerto Rico 3-0 in San Francisco last month. We were there, not only to witness the growing prestige and excitement of the WBC, but also to strengthen our campaign to get baseball and softball back in the Olympic Games by learning the valuable lessons this still young but extraordinary World Championship can teach. The success of the 2013 WBC, which broke all records for attendance, television viewership and social media impact, demonstrates that baseball—and its women’s counterpart in softball—are rapidly becoming a truly global game. The Dominican Republic's championship in the World Baseball Classic demonstrates support for adding baseball and softball back to the Olympic Games. During this tournament, more than 885,000 fans attended games in the Europe, Asia and the United States, television reached into 200-plus countries and TV viewership broke numerous records in countries like Dominican Republic, Japan, Puerto Rico and Taiwan. 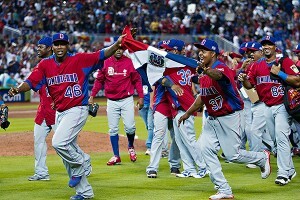 In fact, the championship game was the most watched sporting event in the Dominican Republic in the last 10 years. Facebook drew more than 1 million likes and social media impressions reached beyond 600 million overall, with top trends on Twitter in all the finalist countries. Invented by Major League Baseball (MLB) and its professional baseball partners worldwide, the WBC has risen in only eight short years to a place in the top tier of international sports championships and clearly signals the true potential of baseball to become the world’s next great global game, particularly when you add the women’s side through softball. We believe the quickest route to that goal, to a truly global game, would be to get baseball and softball back on the Olympic program. In 2005, baseball and softball were cut from the Olympic program, in effect, striking out on their key objective to grow the sport globally through the most visible and powerful sports platform in the world—the Olympic Games. To understand the power of the Olympic Games to promote a sport, look at the television audience for the 2012 London Olympic Games this past summer. In a world of 6.5 billion people, 4.5 billion tuned in to some part of the celebration. The largest sport they didn’t see was the one played with a bat and ball by 60 million men and women—and boys and girls—around the world. Softball, which made its last Olympic appearance at Beijing 2008, missed out on a golden opportunity to grow after being axed from the London Games. Baseball and softball comprise the largest sport not in the Olympic Games. Right now, baseball and softball are played in more than 120 countries. But more than 200 countries compete in the Summer Olympics. So there’s plenty of room to grow. And baseball and softball have the distinct advantage of being a game that’s easy to learn. Other than the need for a bat and ball, there are no barriers to entry. Anybody can play the game anywhere regardless of gender, age, social, cultural or religious status. It’s a sport with a proven ability to create mass participation through young people. When baseball and softball put down their roots in a country, they become a family-driven, socially rich phenomenon with fan loyalty that lasts a lifetime and is passed from generation to generation. Why? Because kids find it so easy to play and when it’s played at the elite level—as it was in WBC—it’s one of the most intensely competitive sports on earth. That’s why we have joined forces to get baseball and softball in the Olympic Games—to give every boy and girl in the world a chance to play the game. We share the vision of global growth embodied in the WBC. We believe baseball and softball can become the next great global game through the Olympic Games. Don Porter and Riccardo Fraccari are co-presidents of the World Baseball Softball Confederation and are leading the charge to put their sports back in the Olympic Games. Porter also is president of the International Softball Federation in Plant City, Fla. Previous articleTokyo 2020: Hugely Impressed or Lost in Translation?